If you are considering a walker or a rollator, then it must be either for yourself or for someone who is close to you. If you or your loved one is experiencing pain or weakness while walking or have had a fall, then you must consider buying a walker or a rollator. The difference between walkers and rollators is that they both provide a stable posture. However, rollators have wheels whereas, walkers are with normal stands. Rollators can be easy to use as they don’t require much force by the person due to their front wheels swivel. Hence, purchasing a walking aid can fulfill your many purposes. Such as, it can provide you stability in walking, distributes your weight equally, helps in keeping your body posture straight and can even assist in reducing the pain and contraction of muscles, joints and back. This lightweight rollator by Medline is made of aluminum which only weighs 11 lbs (5 kg). The frame of this rollator can easily support up to 250 lbs. It comes with grip brakes that are easy to control for safety purposes. It also features 6-inch wheels/casters. The most interesting thing that it adds to its features are its seats and arms that can be adjusted to easily accommodate the users from 4’11” to 6’4”. For additional comfort, it offers a combination of backrest and padded seat. It also comes with compact storage that is foldable and lightweight in design for hassle free conveyance. Its lightweight makes it easy to transport from one place to another. According to the research, it is around 40% lighter than the most available wheeled walkers. Great for plus size people. The heavy duty rollator walker is perfect for use in both indoor and outdoor environments. It features an oversized and a softly-padded seat in addition to casters that are 8 inches in size. 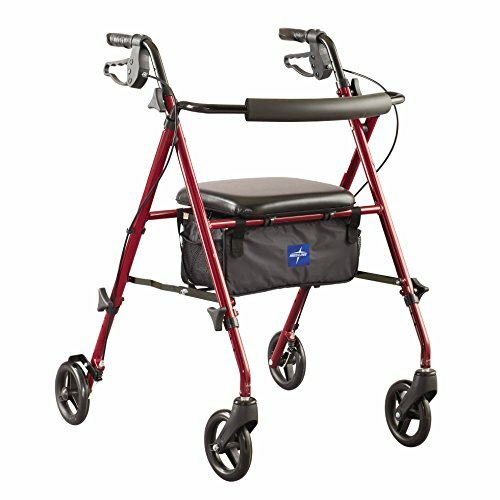 This comfort walker comes with a special internal aluminum casting loop lock. It can be operated with ease and ensures the safety of the user. A large basket can be mounted under the user’s seat and features an additional padded back rest for comfort that is also removable. The height of the handles of this rollator can be adjusted. Its frame is made of steel and can easily support 500 lbs of mass. It comes in two colors i.e. red and blue. This four wheel durable rollator from Drive Medical provides maximum comfort and support that is reliable for outdoor/uneven terrain. For safety purposes, it features loop locks and also a basket that is convenient to keep your personal belongings. The handle height can be adjusted to ensure comfort of the level you desire. It comes with a built-in padded seat with backrest. The walker can be moved easily by simply folding or removing the backrest into a compact size. This walker can improve your mobility and is an ideal solution since its wheels makes it a good choice over standard walker which eliminates the need to lift it. It can easily handle the height of 31-37 inches. The weight of this rollator is 20 lbs. and can support weight up to 300 lbs. It comes with 7.5 inch of non-marking wheels. 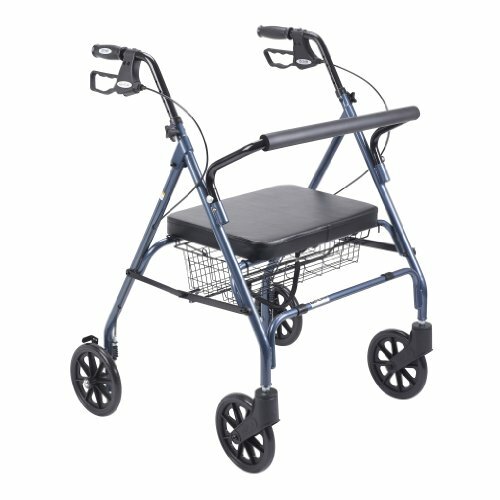 This folding walker from Drive Medical comes with 5 inches of wheels and features a hand grip that is vinyl contoured. Each side of this folding walker independently operates that allows it to be moved with greater stability and ease through narrow spaces. The push-button mechanisms may be operated with palms, fingers or side of a hand. The uniquely designed rear glide cap allows the walker to slide smoothly and easily over most of the surfaces. Its strength is ensured because of its 1 inch diameter aluminum construction. The product weight is 7.5 pounds and the weight capacity it can handle is 350 pounds. Rollators by Hugo give you or your loved one the versatility and compactness that you require in a walker. It accommodates you with the best features. This blue Elite Rollator has a 2-inch flexible built-in seat according to your height with backrest that provides the comfortability to sit and rest. Additionally, this portable aid has an advantage of under seat stockpiling sack that gives security to your resources. You or your loved one would not have to worry about the valuable belongings. Hugo’s Rollator has customizable handle bars that could be adjusted according to your height for appropriate posture. Along with ergonomic hand grips that helps you to place your hands at a natural angle for better brake system. The instrument-free assembly makes this portable item to help in fast and simple set up. The rollator is easy to fold in compact package for storage and even fits into most vehicle trunks. Hugo’s Elite Rolling is intended to help adults and seniors, up to 300 lbs. This item is appropriate for those recovering damage, managing serious joint pain or the individuals who are compromising their balance. With additional expansive 8-inch wheels, this rollator gives you reliability and stability for more certainty and security when strolling inside or outside and incorporates a seat pack for additional capacity. The rollator weighs 21 pounds with the dimensions of 27.5 x 24 x 30 inches. However, this fits most individuals who are between 4’3” – 6’2”. So, measure your height before purchasing it. You even have an option to choose the colors between red or blue. You can enjoy this most convenient and sound rollator at $105 from Amazon.com. Q1: Are the brakes easy to adjust or tighten? Ans: Yes, the brakes are adjustable by rotating the adjustment screw near the brake pad. Q2: Can this be used as a wheelchair? Ans: It is highly not recommended to use it as a wheelchair as it is not built for this intent and could be dangerous. Q3: Does it offer seat height adjustment? Ans: Yes, it does offer that feature. What can be the purpose of buying a walking aid? Offers great assistance in walking. The body weight can be distributed equally. It can help in keeping the body straight and upright. It can help in reducing the strain in the joints, muscles and in the back. Rollators and walkers both provide stability and support for the disabled or the elderly while they are walking. Rollators has wheels on all of its legs unlike standard walkers. It is easier to use a rollator as it can be turned easily because the front wheel(s) swivel. The wheels of the rollator are larger in size than a usual two-wheel walker. Rollators are more convenient to use over rough or uneven terrain. This type of rollators have one wheel (swiveling) in the front and two wheels in the back. They often are designed to have a pouch, basket or both for storage. They are easy to maneuver and mostly preferred for indoor use. They don’t come with seats and aren’t much stable as four-wheel rollators. Four-wheel rollators have two wheels (swiveling) in the front and two wheels in the back. This type of rollators are more stable and provides perfect stability. They usually come with padded seats. Under the seat, a tote bag or storage basket is usually located. Heavy duty rollators or bariatric rollators, usually have its structures and frames made from steel or reinforced with steel. The seats of heavy duty rollators are usually about four inches wide than standard rollators. They heavy duty rollators are about 19 inches wide. The weight capacity this type of rollators can handle is around 400 pounds to 500 pounds. Its wheels are usually wider and larger, which means that they are well supported. This type of walker is usually used by lifting it up. It comes with nonskid rubber-tipped legs that are four (4) in number and it provides the stability which the standard walker needs. Two-wheel walkers have two wheels each one on its two legs at the front. The wheels are not constant but it can be helpful in distributing the weight. The three wheel walkers are usually more maneuverable. It is lighter in weight and provides a perfect balance that can be experienced using a walker having four-wheels. It is one of the most stable form of the walkers available in the market. These type of walkers are an ideal choice for those who doesn’t want to lean on the walker to balance their weight. When it comes to choose the best walker according to the suitability and requirements of your loved one, it leads to complexities and doubts. No worries! Since we have go you the buyer’s guide to evaluate the demands of your loved ones and comprise them to purchase the best rollator or a walker. Knee walker is perfect for resting your knees as it provides you the facility and a proper place where you can rest them. It is similar to a bike that is foot-propelled. What are the things that you should consider before buying this product? Selecting a grip is one of the most important things to consider before buying either a walker or a rollator. They usually come with grips of plastic but there are always options available to choose from like foam grips or soft grip covers. If your hands can get sweaty then please make an appropriate choice. A larger grip is usually recommended to patients with arthritis because they have trouble in grasping the handles. If a correct grip is selected, then your muscles and joints are relieved from unnecessary stress and strain and you will be saved from the deformities happening in the joints. Also make sure that the grips are secure to use and you shouldn’t slip while using the desired walking aid. Make sure the elbow bends is at 15 degrees, when you place your hands on the grips. The grip of the walker must be in-line with the crease that is on the side of your wrist. The size of the walking aid must be right for you. Neither too big nor too small. Your safety should be on the top priority as wring size of the walkers and rollators can be uncomfortable and at the same time dangerous for you. The weight of the walker and rollators cannot be ignored. It should be somewhat you can lift up and maneuver easily. Choose the right option on the basis of your weight. Addition of wheels to the walkers and rollators helps in distributing the weight evenly. The more the wheels, the more stable and secure it is. But if you are afraid of falling, then you should consider a walker without wheels. The walkers and rollators usually comes with two types of brakes i.e. First type of the brakes is to pull a hand-break exactly like bicycles. Second type of the brakes stops the rollators or walker whenever downward pressure is applied. Its construction is usually made of aluminum or steel or the structure is reinforced with steel. If your weight is a lot, then you should consider the ones made of steel. If your weight is less, then you can choose the aluminum made rollators or walkers. If you travel a lot, then you should consider buying a walker or rollator that can be folded. Different walkers have different prices and mostly the prices starts from $25. The rollators are usually priced in the range of $60 TO $200 depending upon the type of rollator and its specifications. Choosing a right walker or rollator isn’t easy for yourself or your loved ones. The one thing that really matters is the safety of the person using it. Purchase the best walker or rollator according to your needs.